Mark Sullivan, on the left in the photo, has had a long career in the poultry industry and he and Bo have known each other for over twenty-five years. On Wednesday Mark brought a group of his customers to the Little Red River for some fly fishing and the Rainbows did not disappoint. It was foggy and cool on the river until almost 10:30AM and the fish liked the conditions as much as we did. Although Mark has done quite a bit of fly fishing his customers were pretty much first timers but they were certainly quick learners. 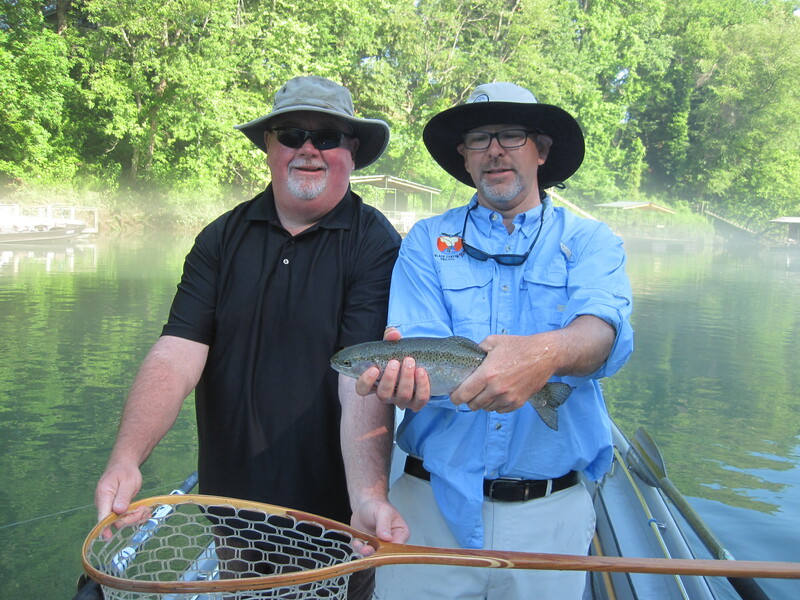 Randy was in the boat with us and his first Rainbow on fly was a fat 18″ slot Rainbow. It does not get much better for a first time fly fisher! We had a great day and Mark has promised to come back and fish with us real soon. Give us a call at 479-459-7071 and book a summer fly fishing trip with Empty Creel Fly Fishing Guides and Outfitter on one of our beautiful COOL rivers!